Go forward in time to January 2006. 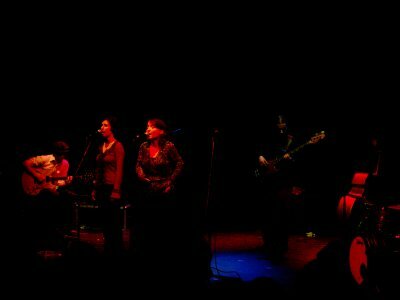 Yesterday, Nóra and I went to the Trafó, a kind of theater in the eastside of Budapest, to see the performance of Egy Kiss Erzsi Zene, a very alternative Hungarian rock band characterized by their lovely singer, a girl who has her own language and sings with it, even when noone can understand her. The musicians are very talented, and the girl has an incredible personality and creativity. Seeing them was really a must. I am sure that many people went to the concert just to laught on her. I can believe it, because during the pauses, when she started talking to the public, I wasn't really sure if she was talking Hungarian or just making her strange noises. Incredibly funny. Finally, I got to Budapest. The travel was very long but comfortable and I didn't bore at all thanks to the 6 hours of laptop that my extended battery gave me. I hacked a few and watched A Beautiful Mind. Given the excitement about the travel, I didn't manage to sleep at all. The trip was a bit tricky. 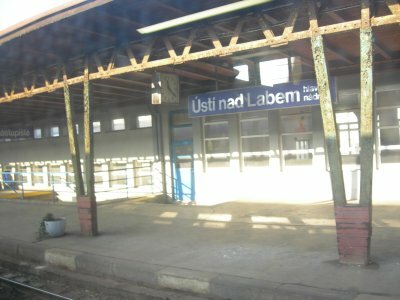 Students in Dresden have a ticket which can be used to travel inside Saxony until the Czech Republic border to the east for free. So I bought only a ticket from Bad Schandau (the last stop of the EuroCity in Germany) to Budapest to spare a little. Given this, I started the travel in Dresden in a InterCity train and jumped off in Bad Schandau, just in time to take the EuroCity. Cool. Once in Budapest, Nóra was waiting for me in the Budapest Keleti PU (eastern trains tation). To see her after so long made me freeze of happyness. I think I was in shock for the first 30 minutes. Budapest and she, altogether, it couldn't have been better. We made the trip to Pérbal in about 40 minutes. Pérbal is a small village in the west of Budapest. It is very nice and quiet. I like it a lot. There I met Nór's mother, who is really lovely and received me as a son :-). Unfortunately, she doesn't speak any language I know, so it is not very easy to communicate with her. Thanks to Nór, that is not a problem. Anyway, I've learned some basic Hungarian sentences to be polite when needed. It helps, but it is not easy. We watched Matrix Revolutions in Hungarian; a movie I haven't had seen, and surprisingly it wasn't too hard to understand the mainline. I guess that Matrix movies doesn't have too much new to offer you after you have seen the first of the serie. Nóra cooked some sweets very lovely. She taught the recipe from a Spanish book and asked me if I knew turrón. I said yes, but thinking in the typical turrones that grandmas make in Chile. The surprise was that the sweets she made are more like the ones called trufas. I don't know if in Spain turrón is different to the chilean one, but I think the book had mistaken the names. Anyway, the sweets are really delicious. Tomorrow begins my holidays vacations. I will be traveling to Budapest, Hungary, in the morning and will meet there Nóra. I am really excited about this travel, first of all because I haven't seen her since she left Dresden like 3 months ago; and secondly, because I've always dreamed about visiting the capital of Hungary. I am not sure about being online during the next days, so I wish everyone outthere a lovely and happy 2006. 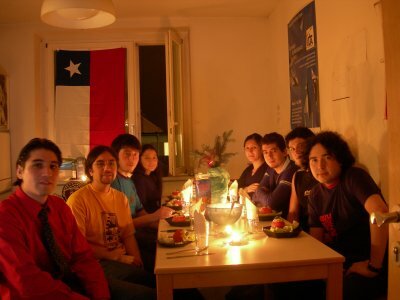 The eight chileans that are still in Dresden for this holidays will have a christmas dinner tonight in my flat. We hope to have a lovely dinner and probably a party after it. I wrote a very simple program to open the viewcvs interface of a directory or file directly from the command line. This way I won't have to be typing the URLs in the browser and can take advantage of the tab completion ability of bash. See it here. It is very simple but it was in my TODO since a long time ago. Lucas writes in his blog about some of the common difficulties that GNOME lovers have when trying to contribute to the project and presents some barriers that new people usually find when they want to give their first steps into the community. At a first glance, it didn't represent nothing new for me, as I could recognize some of these barriers I've faced in my own integration to the project and some of the people I've known in the last time in Chile. What really surprised me is the comments that many guys have left in their post. From the opinions there, it seems to be many guys that feel themselves ignored or ridiculed when they try to start contributing. Is this true? (In 1991), when I started to work seriously in Linux (...) I tried to learn to code with GNOME, but in #gnome channel they treated me really bad, and generally, they treated really bad to people just learning. Then I went back to #kde (...) and started writing Kopete, while I was learning the KDE and QT API, thanks to the Charles, Maksim and others' help. Kopete today is the KDE Instant Messanger client and Duncan a experienced KDE hacker working for Novell. If 4 years ago somebody had known that this newbie was going to grow up and become a mature developer, would he have been treated the way he describe it? I felt more curious today and started browsing the kde-quality mailing list (a kind of gnome-love equivalent) and found several	threads like this one, where every time someone interested in contributing introduces himself, somebody else replies gently. I like that and don't think it is so difficult to do. Many times questions in IRC stay there and get lost. Other times really basic questions are rude answered with a link to google or to the manual. On the other hand, there are really helpful hackers who try to be polite and gently with those making questions, but it seems that it is not enough. Are we doing the right thing? It is easy to understand that many hackers don't want to waste their time helping newbies in the IRC. Nobody has a lot of spare time and everyone wants to use their valuable free time in hacking instead of slowly guiding newbies, but acting this way it would be impossible to increase the contributing base and to recruit new core hackers. Ok, it may be true. 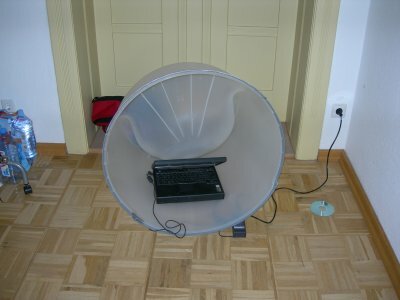 Maybe the 80% of the guys who appears from one day to the next and introduce themselves in irc.gimp.org or a GNOME mailing list probably won't get to be core hackers or really active contributors. But, considering the other 20% that would probably succeed and become real valuable contributors to the project, doesn't worth to be gently with all and take the time to guide everyone, help everyone, and listen everyone? By the way, I would love to see a GNOME Love Day soon. I will try to bother someone in the IRC in the next days. I think that something interesting to do will be a Día GNOME Amor, where the Spanish and Chilean community could focus in a basic-but-not-trivial task (like building the desktop from the sources) and help the Spanish speaker community and all those who don't feel too confident to jump directly to #gnome-love (because of the language, for example). Maybe in the first weeks of January, who knows :-). Wake up this morning to realize that has being snowing since very early. As a consecuence of this, I am seeing through my window for the first time in my life a completely white covered city. I came home this morning like at 4:00 am, after some parties and there was no rain or snow at all. 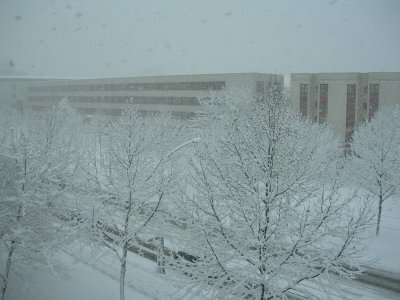 So it has been snowing for less than 10 hours and there are already like 10 cms. of snow. If I don't feel too lazy, I will go the supermarket today to buy food, and will make more pics of the lovely white Dresden. gnome-panel: critical warning: Calling gnome_vfs_uri_unref () with NULL argument. gnome-panel: Add to panel dialog should have "Close", not "Cancel". Critical warnings are important nowadays in GNOME because it is planned that starting January 1st, they will make programs in the HEAD desktop crash. Some of the critical warnings are easy to fix, others probably not. But anyway, finding them, reporting them and taking a look at the backtrace produced when "G_DEBUG=fatal_criticals" is set, will help hackers and maintainers to fix them quickly. Why not to help? ...go and find your bug right now! 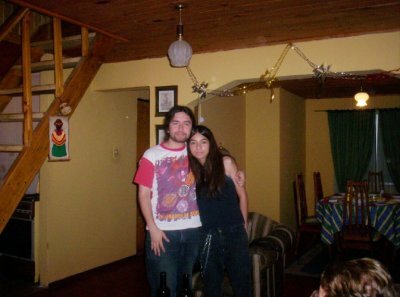 Today, Julieta, one of my sisters, will graduate in her high school in Talca and will receive her Licencia de Enseñanza Media. Am very happy, because I know how difficult has been the last years for she. ¡Felicitaciones hermana! Past Thurstay, we were invited to a party by german friends. 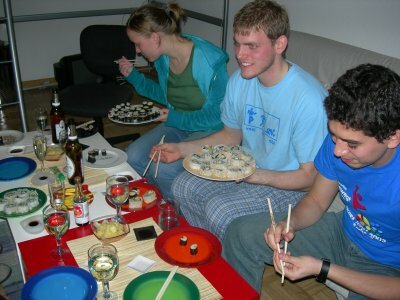 They made some sushi and we brought the Vodka -- excelent combination. That was my first experience with chopsticks. I have to say that I ruined a lot of clumps trying to learn to use them, but finally I managed. The sushi was great but I hated the wasabi. After the dinner, the Vodka helped us to have one of the most funny nights I remember. We had only a laptop without good speakers and the girls really wanted to dance. So, the engineer spirit of the chileans made his most brilliant apport to humanity. At least 'til today. If you pay attention to the plastic couch where Roberto is sitting, to the right, you'll understand how we managed to amplify the poor sound of the laptop speakers. Summary: we took the couch, rotated it, and then put the laptop inside its cavity. The result was a sound like 1.5 times better. Not bad. Then, Juan Luis Guerra made a brilliant performance. It is incredible how much the german girls love latin music. I have to be honest, when I was in Chile, I understimated the effect merengue. Not anymore. Amigos de GNOME en Chile, si quieren, pueden darse una vuelta de vez en cuando por irc.gimp.org#gnome-chile. Actualmente hay poca gente, pero dispuesta a ayudar a quien lo necesite. ¡No seas exponencial, intégrate! I've been really into the study during the last days. I've been learning a little about Haskell programming, trying to take down to earth what I've learnt about Lambda Calculus. It is really funny. Maybe for performance lovers, Haskell is not the ideal programming language. I know. But it is still funny, for instance, that you can define functions using Lists Compresion (a sort of Set Compresion, recall your Set Theory knowledge). But the paradigm change hasn't being easy. I had programmed using scheme and elisp a couple of times, but not enough to start feeling the useful of lambda abstractions and partial applications. In the first days solving some simple problems using Haskell took me longer than I expected, but slowly I am feeling a little more comfortable. Go backwards in time to November 2005.